Hypothyroidism is the most common form of endocrine disorder. It is a condition in which the thyroid gland does not produce enough thyroid hormone. Thyroid hormones play a key role in determining how quickly our body uses energy, makes protein, and controls the sensitivity of other hormones. This disorder is more commonly prevalent in females than in males. Thyroid glands help regulate the metabolism in our body. 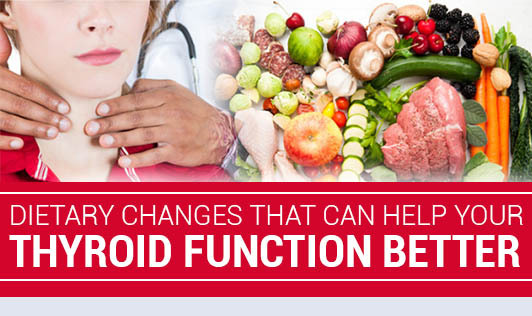 A dysfunctional thyroid hinders with the body’s ability to break down proteins as well as process carbohydrates and vitamins. This is one of the main reasons wherein glandular problems often lead to uncontrollable weight gain in most people. Include Tyrosine rich foods such as fish, chicken, low fat milk, etc. Avoid Soyabean and its products. Selenium rich foods such as whole unrefined grain, garlic, tuna, chicken, etc should be included in your diet. Consume vegetables like Brussels sprouts, broccoli, cauliflower, cabbage, mustard, kohlrabi, and turnips after steaming (avoid in raw salad form). Use iodized salt and ensure that salt is added at the end of cooking. In case of water retention, have natural diuretics such as lemon water, cucumber juice, jeera water, bottle gourd juice, etc. And lastly, live an active lifestyle as it is essential to control Hypothyroidism!